The prime responsibility of today’s younger generation is to raise Sri Lanka to be a shining state in the world minimizing issues related to human resource. However, with the advancement of modern technology, children’s lifestyle has sunk in complexity exposing them to numerous issues such as family disputes, drug addiction, physical and mental violence against children, child abuse and negligence which pose a great threat for them to enter the society as persons with robust personality. Marking the Ministry’s involvement in preventing this situation, the Ministry of Women and Child Affairs has organized a series of programmes to raise awareness of school children and their parents on moulding an outstanding citizen through restraining emotions. 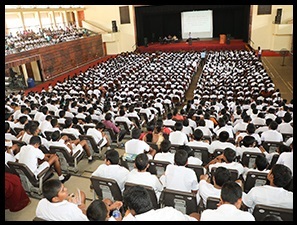 As the first step of this initiative, an Awareness Raising Progromme was held on 22.10.2018 at the National Youth Services Centre from 9 am to 12 pm with the participation of 1000 students representing President’s College, Buvanekaba Vidyalaya, Maharagama Central College and Vidyakara Balika Vidyalaya in the Maharagama Divisional Secretary’s Division of Colombo District and 500 parents. The resource person was Dr. Chaminda Weerasiriwardana, senior Counsellor and Psychotherapist of Kandy General Hospital. The occasion was graced by Hon. Chandrani Bandara, Ministry of Women & Child Affairs, Ms. Asoka Alawatta, Secretary of the Ministry. Officials from the Ministry and the Divisional Secretariat were also present. The objective of this programme was to empower children face challenges with determination, retain sangfroid and go forth with courage. During this session, children were made aware of the techniques of pragmatic approach to control emotions. The success of the programme was proved by the views and proposals of children.